Our Munchkin Shakespeare Kickstarter campaign was quite the show-stopper! Now that we've got our BackerKit survey out, we have a special encore for those who missed the first performance! 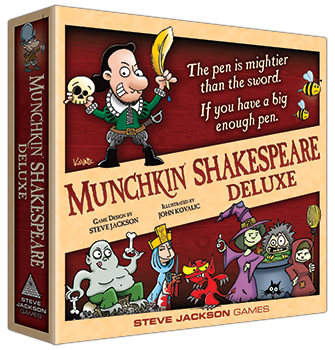 From now until April 17, you can preorder Munchkin Shakespeare at the Play-Goer, Shakespearean Player, or I Want It All! tiers via our BackerKit preorder system. Simply follow that link, select the tier you want, and complete the survey. This is a great way to get the Kickstarter-exclusive expansion, Limited Engagement. If you miss out again, though, be assured that Munchkin Shakespeare Deluxe will be arriving at your local game store after it ships to backers in September. The accessories and exclusive expansion will be harder to find at that point, however. Retailers are welcome to order, as well! As promised, Munchkin Shakespeare is available for direct retailer sales, as well as all its accessories – even the Kickstarter-exclusive expansion! Find out more by signing up on our Warehouse 23 direct sales page, or reach out to our Retail Liaison with any questions. The BackerKit survey and preorders close on April 17, so get your order in before the curtain falls for the last time!